Is it snowing in Åre ?Thank you! The snow forecast for Åre is: Light rain (total 2.0mm), mostly falling on Sun afternoon. Very mild (max 13°C on Mon afternoon, min 4°C on Sun afternoon). Wind will be generally light. Åre Weather (Next 3 days): The snow forecast for Åre is: Light rain (total 2.0mm), mostly falling on Sun afternoon. Very mild (max 13°C on Mon afternoon, min 4°C on Sun afternoon). Wind will be generally light. Åre Weather (Days 4-6): Some drizzle, heaviest during Thu morning. Very mild (max 10°C on Wed afternoon, min 3°C on Wed night). Winds increasing (calm on Thu night, strong winds from the SE by Fri night). Some drizzle, heaviest during Thu morning. Very mild (max 10°C on Wed afternoon, min 3°C on Wed night). Winds increasing (calm on Thu night, strong winds from the SE by Fri night). Light rain (total 2.0mm), mostly falling on Sun afternoon. Very mild (max 13°C on Mon afternoon, min 4°C on Sun afternoon). Wind will be generally light. The above table gives the weather forecast for Åre at the specific elevation of 829 m. Our sophisticated weather models allow us to provide snow forecasts for the top, middle and bottom ski stations of Åre. To access the weather forecasts for the other elevations, use the tab navigation above the table. For a wider view of the weather, check out the Weather Map of Sweden. Resort name is also written as Are. 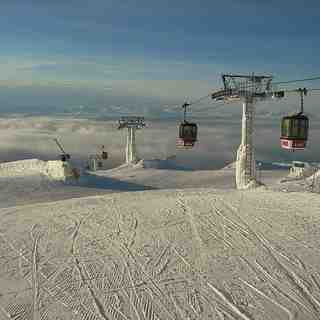 Have had a great ski holiday in Are. I think we were lucky with the weather: blue skies and no wind all week. Went last week of March with perfect snow all over the mountain and no slush even at the end of the day! Probably best later in the season; cold and dark in January I guess. Easy to get to from Ostersund airport and only about a 75 minute drive. Very little traffic. No more expensive than France, with higher standards. Skistar run the resort and in my opinion do an excellent job. If you hire equipment and buy lift passes in advance they give a good price reduction. Also, as the resort is not high, you're not likely to suffer from any altitude sickness. Quite a lot of T bars, however. I think these are there because of the wind that other people have reported on. Plenty of easy off-piste through the trees that my children love. Went over Easter and it was quite busy with some long queues especially in the morning, all quite orderly though. Despite being busy the runs were not at all crowded. All in all, had a great family holiday. Makes a pleasant change from the Alps. If you go, be sure to have a ride on the old funicular. Over one hundred years old and absolutely beautiful! The Åre skiing weather widget below is available to embed on external websites free of charge. It provides a daily summary of our Åre snow forecast and current weather conditions. Simply go to the feed configuration page and follow the 3 simple steps to grab the custom html code snippet and paste it into your own site. You can choose the snow forecast elevation (summit, mid-mountain or bottom lift) and metric/imperial units for the snow forecast feed to suit your own website…. Click here to get the code.